With it’s bright colours, non-stop revelry and sheer exuberance, Chinese New Year is a celebration to look forward to. But with a baby in tow, many parents feel anxious about the festival. Especially if celebrating it means being a guest in someone else’s home. Babies under two years old are still developing their immune system. For this reason, avoid visiting a house that has lots of other people visiting. The more people around your baby, the more chances your baby may get sick, so take precaution when possible. Try not to let people hover over your baby and kindly ask that they refrain from kisses. Cuddles are okay but try to keep these to a minimum if you can. When necessary, you can say you have just gotten the baby settled to tactfully decline any touching or holding. If you really don’t like the idea of taking your baby out on public transport, navigating through the crowds, and visiting a home that’s packed to the rafters with people, consider celebrating at home. Invite friends and relatives into your space and your celebrations are a whole lot easier. Your environment means you’re in control. Your family might insist that you attend the Chingay Parade and other main festivities, but there are just too many people for your baby to be comfortable. Huge crowds are a big no-no for your baby, so watch it at home instead and invite some friends over for the experience! The first time you pack for a long outing with your baby it might seem like you’re packing for a week-long holiday. It might seem excessive but do pack for every situation. The last thing you want is to run out of nappies while on the go. Before leaving home, give your baby a feed and change their nappy. You’ll have fewer things to carry and your baby will arrive feeling comfortable and happy. If your baby is 6 months old or above, consider giving them an organic milk rusk to chew on when arriving. The distraction will be comforting in a midst of new faces and the rusk will provide relief on teething gums. It’s Chinese New Year so, of course, food is going to be a big part of your festivities. But as a parent, you might not be able to find suitable food for your baby or it may be inconvenient to breastfeed. You do not want your baby to fuss or reject food they are not familiar with. 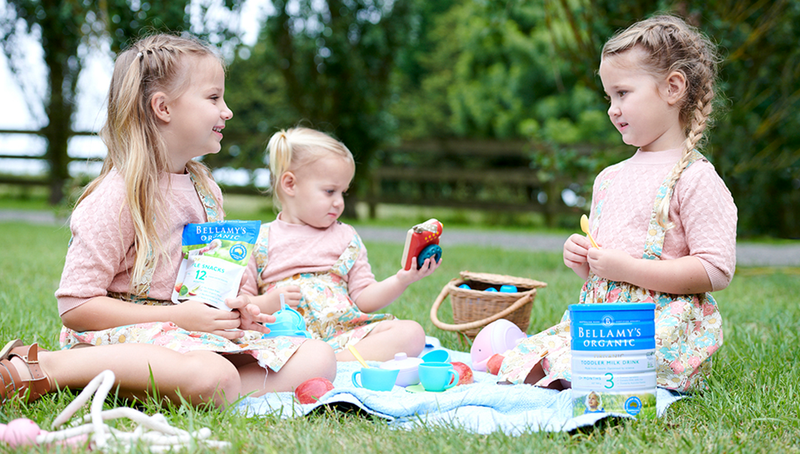 Keep it simple for your baby with Bellamy’s Organic. Even if you are breastfeeding, pack Bellamy’s Organic Infant Formula Step 2 as a backup, it is suitable for babies from 6 months onwards. Rusks, ready-to-serve baby food pouches and snacks are a must-pack too. Routines are important for small children, but one or two days of an unsettled routine isn’t the end of the world. Hold on to the essentials by putting a hedge of protection around nap times and bedtimes, but don’t panic if their usual 90-minute nap turns into a short 45-minute nap. Your baby will cope fine with your host’s routine for a short time. If you can work with your host to plan meal times and main activities around your baby’s sleep and feeding times that’s great, but be careful not to bulldoze your way through their festival traditions. Honour your host’s way of doing things and who knows – you might discover a fun new tradition you can incorporate in your own home next year. Baby clutter will make you feel frazzled, as will digging around in bags when your baby has just spit up or had a nappy explosion. It is better to pack minimally and know where everything is at. Arrange your items so that everything is easy to find in an emergency. This way you won’t stress about unpacking, rearranging or making a mess in your host’s home too. You may plan to ride the train with your baby strapped firmly to your chest but it’s still a good idea to take a stroller or pram with you to someone else’s house. Should your baby not be able to sleep in a house with other people, a quick stroll around the block will be your saviour. Chinese New Year is anything but subdued and enjoying it with the people that matter the most is what Chinese New Year is all about. Convey blessings of good fortune with a clear mind and celebrate being together. Yes, it might be hectic, but with the above steps you can minimise the stress and enjoy feasting with your family while your baby enjoys feasting with Bellamy’s Organic. Good news! This year, NTUC, Cold Storage, Giant and Sheng Siong have announced new operating hours during Chinese New Year. Check out our stockist page to see where you can buy Bellamy’s products today.